Who wants a button? Email owsartsandlabor@gmail.com with your address and we’ll send you one! 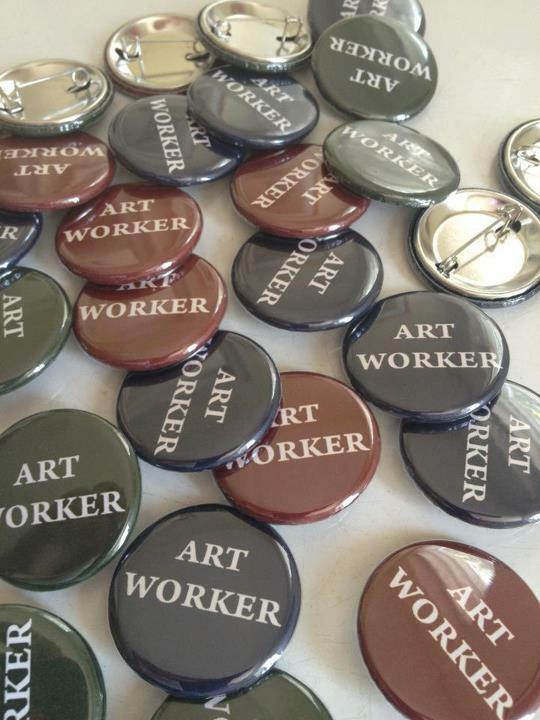 Share this with your fellow Art Workers! On April 20, 2012, Working Artists and the Greater Economy (W.A.G.E.) released the results of their W.A.G.E. 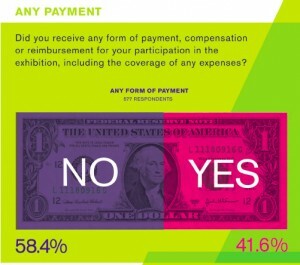 Survey, which gathered data about the economic experiences of hundreds of visual and performing artists who worked with New York City art non-proﬁts between 2005-2010. Read the results and analysis of the survey here. On May 19th, 2012, artist and designer Takeshi Miyakawa was arrested in Brooklyn while installing “I ♥ NY” lamps in a local park, part of a project designed to celebrate NY Design Week and the Tokyo-born artist’s love for New York City, where he has lived for the past 23 years. Miyakawa was charged with the class D felony of reckless endangerment, placing of false bombs, and criminal nuisance. He is being detained for thirty days to await mental evaluation. Public safety need be protected, but so must our human rights of life, liberty, and the pursuit of happiness. Sign this petition to help free Takeshi Miyakawa. This is the second May Day Arts Assembly, involving different arts groups and artists from within OWS, but also expanding collaborations beyond the OWS crowd. Everyone is welcome: artists, musicians, cultural workers, photographers, writers, dancers, filmmakers, interns, art handlers, designers, administrators, curators, assistants, and students. Join us! The assembly is particularly focused on making sure everyone has the resources to support the projects they’re involved with. Join the May 1 Arts email list here. Arts & Labor, a working group founded in conjunction with the New York General Assembly for #occupywallstreet, echoes the call for an Arts Assembly of artists, musicians, cultural workers, photographers, writers, dancers, filmmakers, interns, art handlers, designers, administrators, curators, assistants, and students. JOIN US! We gather to discuss May Day, to build solidarity and coordination between OWS arts groups, and to plan outreach efforts to those not already involved in May Day actions. Arts & Labor is dedicated to exposing and rectifying economic inequalities and exploitative working conditions in our fields through direct action and educational initiatives. By forging coalitions, fighting for fair labor practices, and reimagining the structures and institutions that frame our work, Arts & Labor aims to achieve parity for every member of the 99%. 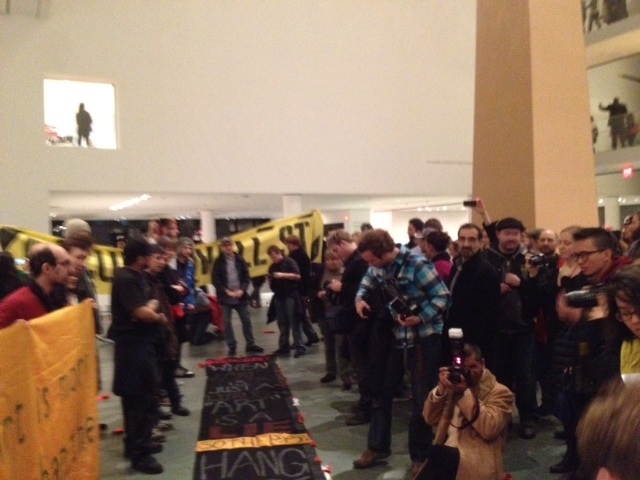 On January 13th, 2012, OWS Arts & Labor stood in solidarity with locked-out Teamsters Local 814, and 16 Beaver in an action at the Museum of Modern Art, bottom-lined by Occupy Museums. 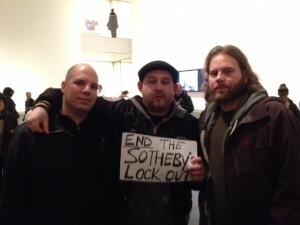 Art handlers from Sotheby’s have been locked out since August 2011. Sotheby’s and MoMA share two board members, including Danny Meyer, who is also the CEO of the Union Square Hospitality group, a corporation that owns the three MoMA restaurants. In the action, Danny Meyer’s restaurant Cafe 2 was mic-checked, and patrons were informed of the lockout of Teamsters Local 814, and Meyer’s involvement as a member of Sotheby’s board of directors. 1/27/2012. Art handlers from Teamsters Local 814, locked out from Sotheby's since August 1, 2011. A General Assembly (GA) was held by members of all working and affinity groups in the atrium, and they invited museum patrons to participate. In the GA, the irony of MoMA staging an exhibition of the revolutionary painter Diego Rivera’s work, while being complicit in the Sotheby’s lockout of 43 Teamsters was critiqued. Patrons and employees of the museum were also informed of the history behind the so-called “Target Free Fridays,” how the admission free Friday was actually made possible through the efforts of the Art Workers’ Coalition, and their protests at MoMA in the 1970’s. Towards the end of the GA, a 30-foot banner was dropped from the 5th floor mezzanine, hanging down below the 4th, demanding that Sothbey’s end their lockout. The banner hung for a while until it was unilaterally acquired by MoMA security. 1/27/2012. 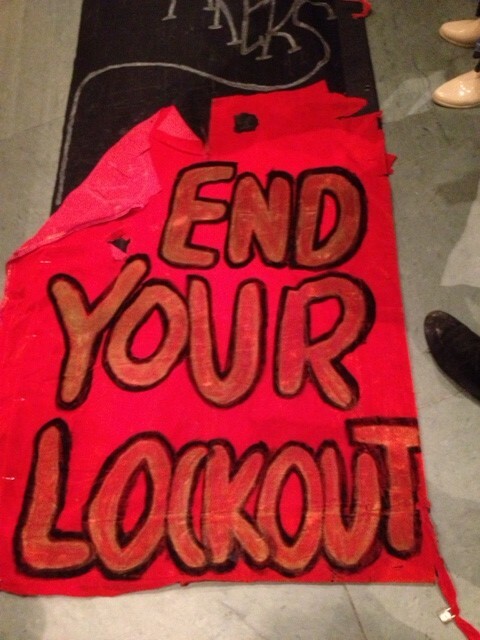 The returned banner which was confiscated by MoMA security on the 1/13 action. On January 27th, 2012, OWS Arts & Labor returned to MoMA with Occupy Museums and members of 16 Beaver to again stand in solidarity with Teamsters Local 814, some of who were present. A boisterous GA was again held in the atrium with speeches made by participants of Arts & Labor, Occupy Museums and Teamsters Local 814. A large, yellow Occupy Wall Street banner was unrolled and held horizontally across the gallery, dividing the space. The issue of the unilaterally acquired banner dropped on Jan 13th was addressed, and terms were stated as to what was required of MoMA, if they were to keep it. The terms were, that when the banner was displayed, it would be displayed with museum notes accurately describing how the work was acquired, that the Art Workers’ Coalition (AWC) be credited with “Free Fridays,” and that MoMA and Danny Meyer would come forward to demand Sotheby’s end their lockout. The head of MoMA security, a fellow art worker, approached the GA, standing behind the unrolled banner, and politely let the GA know his job was to ensure the safety of museum guests and artworks in the museum. This was responded to with enthusiastic “twinkles” from the GA. He explained he would like to return our banner on behalf of the museum. He handed the rolled-up, confiscated banner, in a white plastic bag over the yellow banner. The terms were loud and clearly stated again; clarifying that its return meant that MoMA was turning its back on the locked-out Teamsters. The plastic bag was cut open and the banner was unrolled. 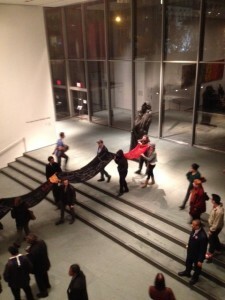 The banner was spontaneously lifted at points by participating members and slowly marched out the gallery and down the museum steps, as if it were an extra long coffin. Spontaneous mic-checks erupted, and museum patrons clapped and cheered. 1/27/2012. 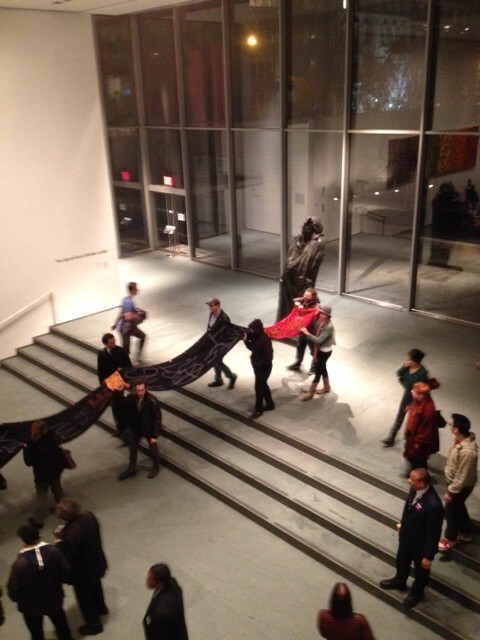 Members of Arts & Labor and Occupy Museums leaving MoMA with the banner. 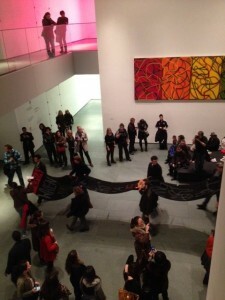 Members of OWS art coalitions and Occupy Sotheby’s continued to carry the banner through the lower lobby of MoMA and walked through the gift shop, startling and surprising browsing museum goers. The banner was eventually placed outside on the sidewalk. Casual conversations ensued and one of the artists of the banner began dripping red paint over the banner. Then, one of the members of the Novads, the art collective responsible for making the banner, asked the locked out Sotheby’s art handlers if they would like to cover their hands with red paint and “sign” the banner. The Teamsters covered their hands with paint as did members of Occupy Museums, Arts & Labor and 16 Beaver, placing their hands on top of the banner in a sign of solidarity and creativity. The action ended with a triumphant applause from OWS members and union participants; the artists of the banner finally carried it away, down 53rd street. All photos by Leina Bocar. 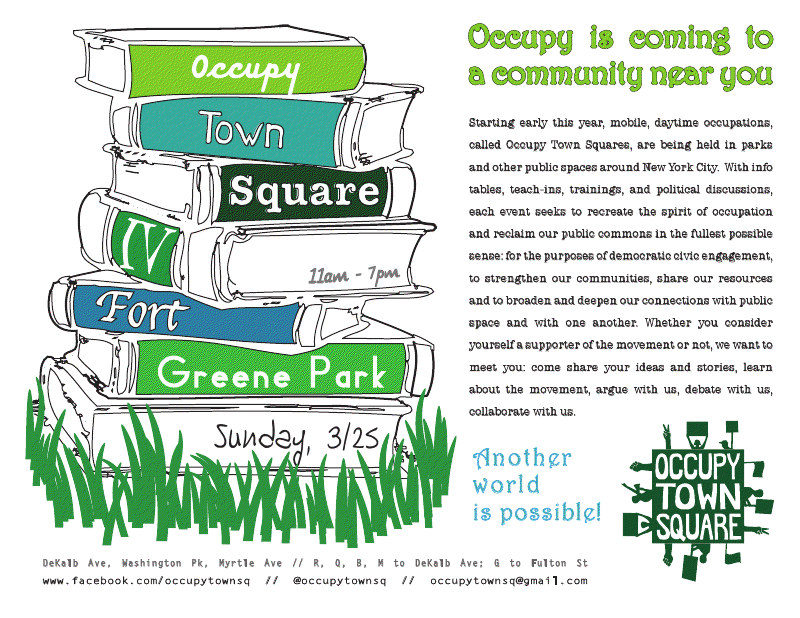 WHERE: Occupy Town Square in Fort Greene Park, Brooklyn. Last night Chelsea Sculpture Park Director Deley Gazinelli came to the Arts and Labor meeting and made us aware of this conflict of interest between public space and private interests in Chelsea. Details are below. 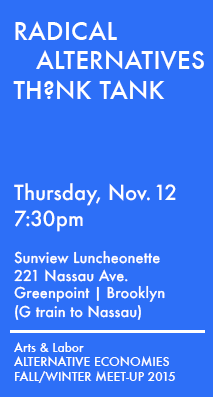 Please consider supporting the park tonight at the community board meeting. Please testify and urge Community Board 4 to reject the resolution supporting Marlborough Gallery. During the past few years, we the founders and supporters of the Chelsea Sculpture Park have mobilized the Chelsea community, including residential, civic, educational and religious organizations, galleries, the Art Dealers Association of America and members of the art world, in order to promote the creation of a sculpture park in Chelsea Cove. In addition we were able to secure the endorsement of our local elected officials and the essential support of Community Board 4 (CB4). One of the main objectives of Chelsea Sculpture Park is to help raise funds for the long term maintenance of the 9.2 acre site. This objective addresses the legislative intent of the Hudson River Park Trust which specifies that the park must be financially self-sustaining. The other important goal is to offer a democratic mechanism and artistic expertise whereby the gallery community, museums, foundations and artists’ estates have the opportunity to exhibit significant works of art on a curatorial basis. Unfortunately, on February 9th, the Waterfront and Parks Committee of CB4 voted to submit a resolution on March 7th to the Full Board supporting Marlborough Gallery to use the site to sell its wares. We are very concerned that Marlborough Gallery, a commercial business, is using a public park as its own private space to showcase works that are for sale. Furthermore, Marlborough Gallery has demonstrated no intentions of donating a portion of the millions of dollars in profits from the sale of these works with the Hudson River Park Trust. CB4 must honor its previous support of Chelsea Sculpture Park and adhere to the hard won community hearing process already established. On March 7th we will be respectfully asking CB4 Full Board to reject the resolution. Chelsea Sculpture Park is committed to help raising funds to maintain and preserve the Chelsea Cove site for future generations. Marlborough Gallery will be using a public park to make millions of dollars. Please testify and urge CB4 to reject the resolution supporting Marlborough Gallery.